Ball Head There are 2 products. 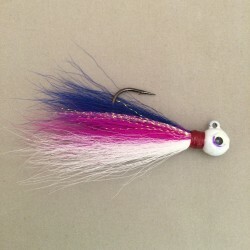 This 3/8oz jig is available in the most popular colors. This jig has been proven to be an extremely productive teaser. Because of the weighted action it has out fished most regular teasers. Very popular amongst fluke fisherman and charter boats and its also perfect for casting with light tackle.